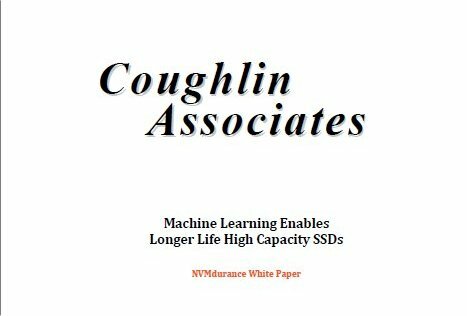 Dublin, Ireland and San Jose, Calif – July 26th, 2016 – Irish technology company, NVMdurance, extending the life of solid state discs (SSDs), has today launched a white paper that provides detailed information on how machine learning can optimize the trade-offs between storage capacity, endurance and data retention of flash memory products. The way that data is stored in flash memory devices can lead to wear and limitations in data retention with repeated erase and program cycles and even with multiple reading of cells. These issues become even more important as the number of bits per flash memory cell increases. The tuning of registers in 2D as well as 3D flash memory can be used to optimize flash wear, storage capacity and data retention. 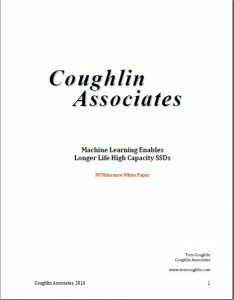 The white paper, Machine Learning Enables Longer Life High Capacity SSDs, prepared by Coughlin Associates , explains about the trade-offs between storage capacity, endurance and data retention and how machine learning techniques such as that provided by NVMdurance can optimize these important flash memory characteristics.